You can select several campaigns (groups, ads, keywords) at once by holding the keys Shift or Ctrl. To select all campaigns (groups, ads, keywords) displayed in the tab, simply select the first and then simultaneously hold the keys Shift and End. 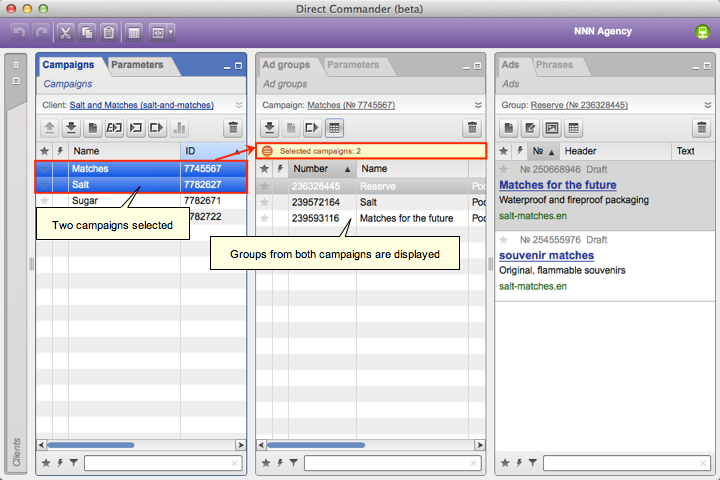 If several campaigns are selected, all ad groups related to them are displayed. If several groups are selected, all ads and keywords related to them are displayed. The Navigation links located on top of the tab will help you determine which ad or keyword belongs to which group and campaign. for mass editing of ads and keywords using find and replace.